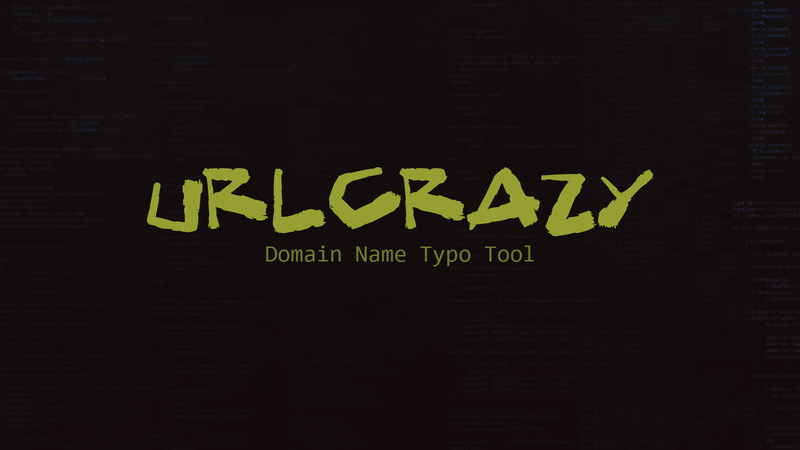 URLCrazy is a Ruby-based tool that allows you to generate and test domain typos and variations to detect and perform typo squatting, URL hijacking, phishing, and corporate espionage. Note: The output will often be wider than the width of your terminal. If this bothers you, output your report to a file or increase the width of your terminal. Swap vowels within the domain name except for the first letter. For example, www.google.com becomes www.gaagle.com. Over 450 sets of words that sound the same when spoken. For example, www.base.com becomes www.bass.com. One or more characters that look similar to another character but are different are called homogylphs. An example is that the lower case l looks similar to the numeral one, e.g. l vs 1. For example, google.com becomes goog1e.com. For example, www.trademe.co.nz becomes www.trademe.co.nz and www.google.com becomes www.google.org Uses the 19 most common top level domains. Each letter in a domain name is an 8bit character. The character is substituted with the set of valid characters that can be made after a single bit flip. For example, facebook.com becomes bacebook.com, dacebook.com, faaebook.com,fabebook.com,facabook.com, etc.